The weakness in global debt capital markets had a notable impact on debt origination fees earned by investment banks around the globe in Q3, with Thomson Reuters estimating that total debt origination fees earned by global investment banks for the period were 10% lower than the figure for the previous quarter, and a good 24% below the figure a year ago. The primary reason for this was that increasing interest rates in the U.S. have led companies to be more reluctant to tap into the debt markets over recent months. The pressure on debt origination fees is evident from the fact that combined fees for the five largest U.S investment banks fell to $3.3 billion in the third quarter of 2018, from $3.8 billion in Q2 2018 and $3.7 billion in Q3 2017. 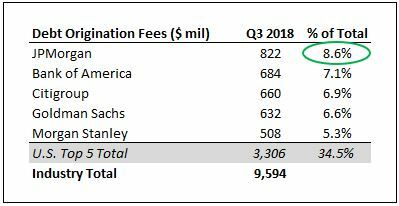 While all major U.S. investment banks reported a sizable reduction in debt origination fees year-on-year (except for Morgan Stanley), Bank of America stands out with a sharp 29% reduction in these fees between Q3 2017 and Q3 2018. We capture the trends in fees for each of these investment banks over recent years in detail as part of our interactive model on debt origination fees, while also forecasting how these revenues are likely to change in 2018. We highlight key observations related to their debt origination fees below. The table below details the trend in debt origination fees for each of these banks in the last five quarters. The green-to-yellow shading along a column highlights the relative performance of each bank in any given quarter. 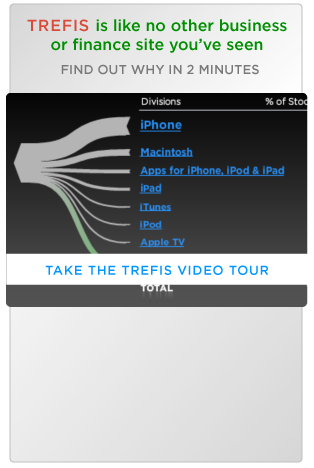 These banks usually capture around 35% of the global debt capital market wallet share for any given quarter. Total debt origination fees for the industry are taken from Thomson Reuters’ latest investment banking league tables, and include fees from syndicated loans. Figures for individual banks are reported as a part of their quarterly results. Bank of America and JPMorgan are the two biggest players in the global debt capital markets, with one of the two banks capturing the #1 spot in terms of total debt origination fees every quarter since the economic downturn. In fact, these banks have captured the #1 as well as #2 position in all but two of the last 35 quarters (Citigroup was #2 in Q4 2015 , and Goldman secured the #2 position in Q4 2017). While both banks have a strong grip on the U.S. debt capital market, Bank of America has historically fared better in U.S. investment grade corporate debt, while JPMorgan has the upper hand in the U.S. high-yield corporate debt segment. However, Bank of America had an uncharacteristically weak period as it lost a chunk of market share in the U.S. high-yield corporate debt market to smaller peers Credit Suisse and Wells Fargo. As high-yield corporate debt origination generates a higher amount of fees for investment banks per dollar in capital raised compared to other debt categories, this has a clear impact on Bank of America’s total fee figure.